Specificity :Recognizes the 33kDa CDK2 protein. Immunogen :The antibody was produced against synthesized peptide corresponding to the C-Terminus of the human CDK2 protein conjugated to KLH. Sample Data :Anti-CDK2 (1:200 dilution) used to detect cdk-2 in asynchronous HeLa cell lysates (run in duplicate). Cdk-2 is indicated as 32-33 kDa band. Note that multiple isoforms as well as phosphorylated forms of cdk-2 may be detected by this antibody. 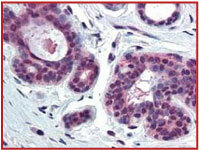 Sample Data :Anti-CDK2 antibody was diluted 1:500 to detect CDK2 in human skin tissue. Tissue was formalin fixed and paraffin embedded. No pre-treatment of sample was required. The image shows the localization of antibody as the precipitated red signal, with a hematoxylin purple nuclear counter stain. Scientific Background :Anti cdk2 antibody recognizes a protein encoded by a gene member of the Ser/Thr protein kinase family. This protein kinase is highly similar to the gene products of S. cerevisiae cdc28, and S. pombe cdc2. It is a catalytic subunit of the cyclin-dependent protein kinase complex, whose activity is restricted to the G1-S phase, and essential for cell cycle G1/S phase transition. This protein associates with and regulated by the regulatory subunits of the complex including cyclin A or E, CDK inhibitor p21Cip1 (CDKN1A) and p27Kip1 (CDKN1B). Its activity is also regulated by its protein phosphorylation. Two alternatively spliced variants and multiple transcription initiation sites of this gene have been reported. 1. Elledge, S.J., et al. : A new human p34 protein kinase CDK2, identified by complementation of a cdc28 mutation, is a homolog of Xenopus Eg1. EMBO J. 1991: 10; 2653-2659. 2. Giordano, A., et al. : Cell cycle regulation of histone H1 kinase activity associated with the adenoviral protein E1A. Science. 1991: 253; 1271-1275. Tsai, L.H., et al. : Isolation of the human CDK2 gene that encodes the cyclin A and adenovirus E1A-associated p33 kinase. Nature.1991: 353; 174-177.